Catamarans have a relatively long length along the waterline and no ballast at all, and consequently hold a straight line very well. The pressure on the rudder is relatively low as well, so they are easily steered. They accelerate far faster than monohulls in the puffs, however, which causes dramatic fluctuations in the apparent wind angle. The same is true in the lulls: they slow down quickly and the wind swings aft. The principle is as follows: when a gust hits a monohull, it causes increased heel and minor acceleration and the apparent wind swings forward only a little. A multihull is unaffected by heel but accelerates quickly; the apparent wind angle swings forward markedly. 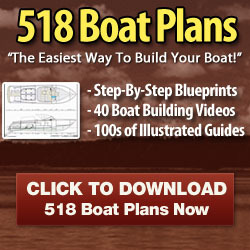 This explains why catamaran sailors have always relied almost exclusively on autopilots. However a windvane system can be useful on extended voyages. Servo-pendulum systems can produce perfect steering on catamarans. The great speed potential allows the pendulum rudder to generate substantial steering force. The wind vane functions well as the steering impulse generator as long as the wind strength and angle remain constant. It is no good in gusty weather or if the wind strength is variable because the windvane system will snake all over the place. In these conditions the wind vane can be removed and a small autopilot (cockpit autopilot) used to furnish the steering impulses. 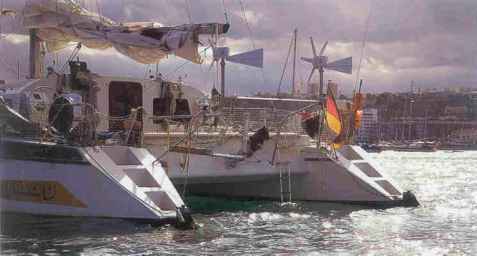 This 15m/48 ft catamaran moored off Las Palmas sailed around the world with a Windpilot Pacific. A servo-pendulum system can obviously only function if steering force transmission to the main rudder is smooth. The steering lines should not under any circumstances be lead via the wheel adaptor to a wheel steering system as the wheel is normally some way from the stern on a catamaran. Transmission to the emergency tiller works only if the wheel-steering mechanism can be disconnected; this of course assumes that the helmsperson can easily reach (and steer with) the emergency tiller whenever necessary. A better approach involves parting the mechanical connection between the two rudders, leaving rudder no.1 connected to the wheel for manual steering and for fine trimming the course when the windvane system has the helm, and connecting rudder no.2 to the servo-pendulum gear via the emergency tiller and the steering lines. Hydraulic steering systems can also be adapted by this method. Auxiliary rudder and double rudder systems are not suitable for installation on catamarans. The aft beam crosses high above the surface so mounting the gear sufficiently close to the water proves difficult. Even if mounting on the aft beam was possible, it would still leave the auxiliary rudder completely exposed to flotsam.